What is the Daf Yomi? What is the Daf Yomi Mesechta Review? The Daf Yomi Mesechta Review is an exciting and innovative audio “chazorah” system which helps you review and REMEMBER the daily daf. Each tape/CD (English) provides the highlights of every daf in a well communicated and easy to follow format. Because each 60 minute shiur covers an average of 20 Blatt, you can easily review an entire week of shiurim in under 20 minutes! Imagine really being able to remember all the famous Gemoras you wished you would remember! 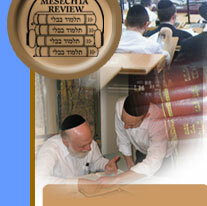 See full list of available Daf Yomi Mesechta Review Shiurim. Are the Daf Yomi Mesechta Review shiurim used and endorsed by Gedolei Yisroel? Absolutely! In fact, Daf Yomi Mesechta Review shiurim have been used by thousands of Daf Yomi learners, as well as hundreds of Maggidei Shiur, Rabbonim and Roshei Yeshiva around the world. The project was encouraged and endorsed by Gedolei Yisroel including Harav Avrohom Pam, zt”l and Harav Mordechai Gifter, zt”l. Who are the Maggidei Shiur for the Daf Yomi shiur? Expert Maggidei Shiur from across various Yeshivos and Kollelim who give over the highlights of every daf in a clear and concise manner. Can I try the Daf Yomi Mesechta Review without risk? Do the shiurim actually review the full text of the Daf Yomi? No. These shiurim only review the highlights of each daf. This narrows down the key issues so you can remember them better... Major machlokes and maskonos from each sugya, famous pisgomim and mussar statements, significant halacha l'maisa, and critical Shas inyonim.